First off, I don't have win 10. But from what I understand there was an update to windows 10 somewhere around the first of October that added TruePlay. So rolling back an update might do the trick; but I actually have some doubts, seems like it would be something that can't be truly disabled and the "opt-out" may just be about the data they collect and send to the TruePlay servers. Okay so I've found a couple of addresses that match the money/credit value. They dont change when i change the value, nor do they when i change the registry value. It just changes the on screen amount... not the actual money value. So I'm trying to locate it as a hidden value using Unknown initial value of All types. 4 Billion results come up but when I do the next unchanged scan absolutely nothing comes up. As usual any help is greatly appreciated for a novice like me! Would you mind detailing what got the debugger working, so others can more easily follow? I'd try it with just 4 byte, I'd be willing to bet the values will be encrypted. Chris Fayte just did a new tutorial about encrypted values. I've just seen this, going to watch it later, thanks! Then I did what Dark Byte said as I hadn't updated cheat engine to the latest version (6.8.1). then enable DBVM on the about screen. After that I just loaded up FH4 whilst disabling my internet connection. I am still having issues with the game crashing. If I launch the game, after enabling DBVM, it always crashes on the initial loading screen (before I even attach the debugger to the game). I followed all the same steps outlined above by greenfrog. cheat engine version 6.8.1 on an i7-4770k. Game is installed on a separate 2TB HDD. OS and Cheat Engine are installed on a SSD. Credits are encrypted, you need to do a unknown initial value/changed/unchanged scan. Right click on CE icon and click to launch DBVM. I also had kernelmode debugger enabled in settings. 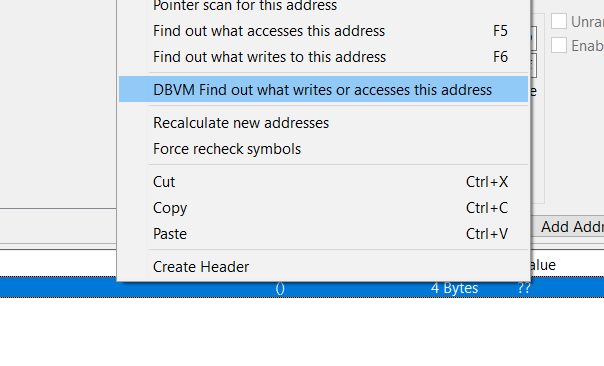 Then right click on any address and choose "DBVM: Find out what"
Have been doing the changed/unchanged scans, but I can never find a solid result that I can verify as credits/money by changing the value slightly. Will keep trying. As for the DBVM, I can use the normal find what accesses/writes commands on values somehow. Is it suggested to use DBVM anyway? Amateurhackerman - Have you tried restarting your PC? A restart or a sleep is required to disable DBVM from cheat engine. When I did this the initial loading screen crash stopped and the game ran fine. Worked for me, hope it works for you. I tend to just freeze encrypted values to find the right one. And yeah, when enabling DBVM it even tells you to restart the PC; and for what I understand it has to be a true shutdown and restart, not sleep or hibernate. And win 10 doesn't do that by default, it only goes into a hibernate state when you shutdown; and you have to enable a setting somewhere to get a true shutdown. yeah man, keep hitting bad addresses and crashing though. It takes sooo long to get back to sub 50 results though. in FH4. Guess I'll have to keep trying until I find the value. I got my scan down to 10 results, but none of them were credits. I was only doing changed/unchanged scans. There are quite a few screens in Forza... I'm wondering if the value disappears when you're not in the garage menu. Are other games like this? I subtracted credits by buying stuff, and added credits by winning a race. I didn't fumble the scan types. I don't know why I cant find the address. Any help would be super, thanks! Did you exit your house and do races between scans? Do any of those look familiar to you? I've frozen all of them and the credits donn't freeze. 'Failure determining what "vehdebug-x86_64.initializeVEH" means'. maybe db can help you with this, or if its TruePlay then find a way remove/disable this MS-Patch. I activate DBVM in "aboute" but button "start watch" not active, is this becouse physical address=invalid? What need to do for fix it? I finally found the credits address. You don't need to use DBVM if you want to make a one time change to the value ie. make it 999 million (more than enough money). If you're wanting to make a cheat table however, I'm not sure I can help you with your problem.